Since I was a young girl, travel has put a sparkle in my eyes. I long for the change of scenery and perspective so if I stay in one place for too long, I get itchy feet. In college, I did a six-month semester abroad in New Zealand and when I came back, I couldn’t wait to set out on my next adventure. Life and finishing college kept me in place for a while. I ventured around New England and Arizona and had a grand time on little excursions in the states. Then I got married and shortly after, my husband was given the opportunity to work in Barcelona for three months. I told him to take the opportunity because I believe travel is one of the most important things in life. I also got to visit him for two weeks and spent a weekend in Paris with him, which was magical. It almost made up for how much I missed him. This past winter, he went on a business trip to Amsterdam. I didn’t accompany him because he was only gone for ten days. I hosted a Galentine’s party at my house and hung out with my pup. When he was offered to go again in April – I wanted to join him so badly! I’ve always dreamed of visiting the tulip fields. But my mindset was stuck in #adulting mode and I thought I shouldn’t go. I had a conversation with my Aunt Michel and also a friend from work who encouraged me to go after my dream of seeing the tulip fields. I looked up flights and they were just too expensive. So, I prayed for a cheaper flight to become available and the next day, I found the cheapest round trip fair to Europe that I’ve ever seen. Heck, it was the price of a flight to Florida during peak season. I took it as a sign that I should jump for the chance to go! Of course, the cheap flight involved an 11-hour layover in London so I started the journey with a little mini adventure. I shared a how-to on using your long layover to explore for those interested (that's how I saw San Fransisco when I was 20!). When I arrived in Amsterdam, I planned to rent a bike and explore the city all day until Scott got out of work. Instead, I just kept walking. Every corner I turned brought me to another stunning view and I quickly fell in love. I found a little pizza shop to charge my phone and people watch. The baker made me the most delicious rosemary bread to snack on. I felt like I was in heaven. 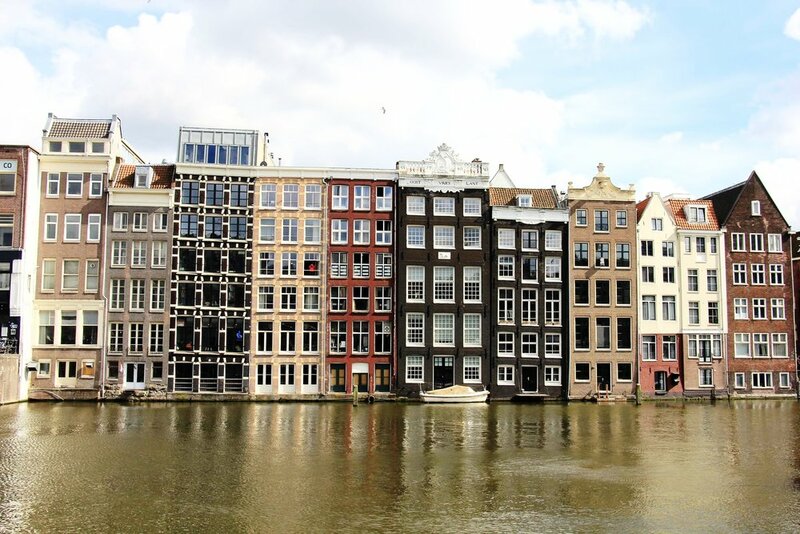 Amsterdam is flourishing with plant life and budding trees along the most delightful canals. Every building tells a story of where it came from and the history that the city brings. It rains intermittently every day in Amsterdam (or at least in my experience it does) and during one light rainfall, I ducked into the Amsterdam Tulip Museum. Did you know tulips originated in the harsh rocky climate of Turkey? I didn’t, but I do now. The Dutch had a period of hysteria over tulips, quite understandably, and that is how Holland is so well known for its tulips. They certainly do know how to grow lush plant-life in their country! After the tulip museum, I visited the famous flower market where the ceilings are filled with hanging flowers. It was a dream come true to see this! Once I had my fill of the city, I took the 307 bus to Purmerend, a quaint farm town in the Netherlands. This is where Scott was staying. We had a nice dinner and the waiter gave us a little back-story of King’s Day, which would be taking place the next day. Essentially, it’s the birthday of their King but also, it’s a day where children are taught the value of earning their own income. When we ventured into Amsterdam the next day wearing our orange garb, following King’s Day tradition, we noticed children hosting their own little flea markets and also saw some children playing the cello and violin! It was so darling. Scott and I were thankful that he had the day off to enjoy King’s Day with me. We had so much fun! It’s amazing how exploring a new place together makes us learn more about each other, even after eight years together. Our faces were beaming all day and we couldn’t get enough of the city and each other. I had the next day all to myself as Scott went to work. I debated taking the train to Brussels since it is so close, but I wanted to instead explore the farm town and find windmills! I had such a short time in the Netherlands that I wanted to focus on really getting to know that area. I started out on foot for a few hours, just walking where my heart led me around Purmerend. I found a walking path and explored there for a bit. At one point, I was struck by the beautiful music that the local birds were signing and I found a bench to sit on and just soak up the moment. I felt so much peace and felt incredibly lucky to be in the place that I was. Winter doesn’t sit well with me so I felt like I was shedding a hard outer-shell as I basked in the sun and listened to the songs of nature. The lush green plant-life surrounding me also didn’t hurt. I then walked to a bus stop and went to Amsterdam’s Centraal Station. From there, I asked the train service clerk to send me to the best spot for windmills and she sent me to Zaanse Schans. Not only did this little town have gorgeous windmills, it had the most quintessential Dutch homes. It was a bit of a tourist town, but absolutely charmed me. 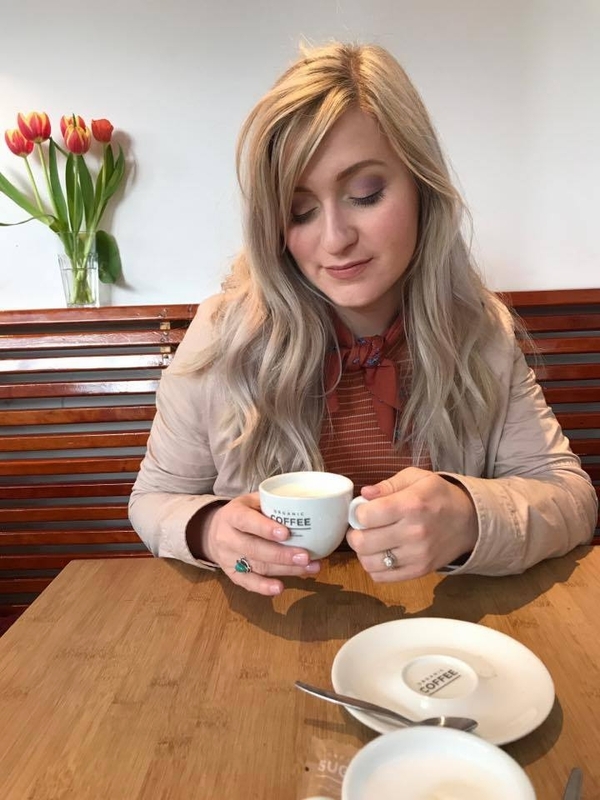 When I arrived in the town, I ordered a cappuccino but didn’t notice they only accepted cash (I have a travel card and didn’t need cash up until this point) – that’s when a wonderful stranger put down five euros for me and dashed away before I could blink. It was so kind! Being a solo female traveler can be slightly daunting at times, but I’ve always had such luck and I meet the best people. It always restores my faith in humanity. Once I finished my coffee, I trekked to the Zaanse Schans open air museum and was delighted by the roaming sheep grazing on lush grass right in front of the green homes and windmills. After a successful day, I met Scott for dinner and we planned our next day together. It was Saturday, so Scott had the day off. Saturday morning, we had some yummy breakfast and then traveled to Schiphol Airport to check into the Citizen M hotel. Schiphol Airport has a bus that goes straight to Keukenhof, also known as the Garden of Europe. Navigating how to get there from the airport was so easy! There, we saw more tulips than the eye can see. It was quite crowded, but for good reason. The garden’s arrangement of florals was the most spectacular thing I’ve seen in a long time. We were absolutely charmed. After we got our fill of the gardens, we walked to the tulip fields. I walked along a sea of yellow tulips as a glorious windmill shined in the background. The air was filled with the an aroma quite similar to the most fragrant Starburst candies. We saw a pink floral field across the way and snapped some photos there, too. We even took the standard “lead me” photo since there was no other way to get a photo of us together (besides a selfie, of course! ).